Chuck, We enjoy the beauty and quality of your work on a daily basis. I feel very strongly about your incredible talent, meticulous work and concern for customer satisfaction. Thanks for not only being so professional but an artist as well. Looking forward to our next project! In the beginning, I thought I was hiring a painter. After speaking with Chuck, I realized there was much more. He demonstrates a real passion and expertise for the different textures and techniques acquired from teachings in Europe. Chuck arrived with samples of his work and several ideas. He was able to tell me exactly how much it would cost, how long it would take, and stuck to his word unlike some contractors I have hired in the past. His professionalism is second to none. I would definitely recommend Chuck for your next project. Chuck, I have enjoyed working with you. I am sure we will do more in the future. Your integrity, professionalism, and craftsmanship are what I am looking for. Chuck is an extremely reliable, professional, and honest painter. He does meticulous work. 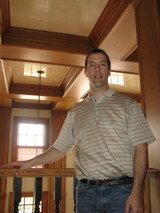 He painted our entryway, formal living and dining, both family rooms and our kitchen cabinets. I highly recommend him.